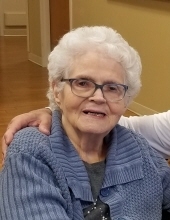 Lillian Agnes Primrose Hershberger, 93, of Lapeer, (formerly a long term resident of Imlay City and Troy Michigan) went to be with her Lord Monday, March 25, 2019. Lillian is survived by her children: Carole Isom of Howell, Trudy (Terry) Filer of White Rock, NM, Faye (Jack) Preston of Imlay City, Gregory Hershberger of Tennessee, Helen (Stuart) Chemtob of Silver Springs, MD, Gerald Hershberger of Norfolk, VA and Mark Hershberger of Brighton; seventeen grandchildren; many, many great grandchildren. She was preceded in death by her husband, Gerald R. Hershberger in 1990; her son, Gary Hershberger; and her parents. She will be deeply missed and her love and beautiful spirit will shine on throughout eternity. Memorial contributions may be made to Suncrest Auxiliary, 1455 Suncrest Drive, Lapeer, Michigan 48446. Visitation will be 4-8PM Thursday, March 28, 2019 at Muir Brothers Funeral Home, Lapeer. Lillian’s funeral service will be 11:00AM Friday, March 29, 2019 at Muir Brothers. Pastor Dan Burger will officiate. Cremation will follow services and burial at Oakland Hills Memorial Cemetery will take place in the near future. "Email Address" would like to share the life celebration of Lillian Agnes Primrose Hershberger. Click on the "link" to go to share a favorite memory or leave a condolence message for the family.